This elaborate feast greets Catelyn Stark as she meets with Renly Baratheon on behalf of Robb Stark (The King in the North!) at Bitterbridge. It also served as my source material for my third annual Game of Thrones season finale dinner party. "They began with pears poached in wine...."
I had set out to do a Highgarden themed finale feast. One of the chief reasons was to make use of a set of elegant glass vases and pink fake flowers I had recently acquired, which seemed to fit best within the “fabled bounty of Highgarden.” It also seemed, halfway through Season 6, that the Tyrells had reached a pretty high point in terms of power over the Iron Throne, and it seemed fitting to award them with a finale dinner. 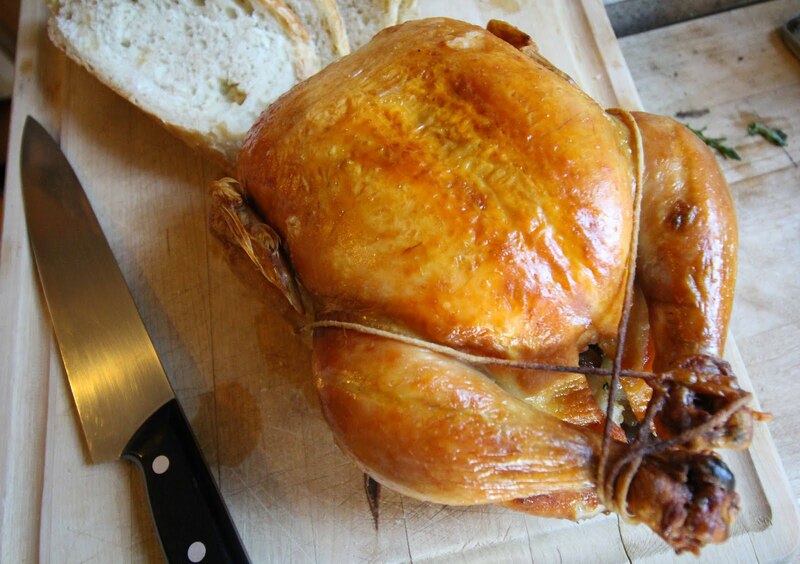 "Capon stuffed with onions and mushrooms." "Mounds of turnips (not shown) and sweetcorn and pease"
Instead, I based my feast around the above passage from A Clash of Kings, set at a smaller keep not too far from Highgarden. Serving fewer people than Renly’s entire force, I omitted the roasted geese, spun sugar unicorns and apple crisps. I served hippocras (“We have Dornish red and Arbor gold, and a fine sweet hippocras from Highgarden.” – A Feast For Crows), homemade mead brewed especially for this purpose, and Wassail – a medieval-sounding drink that has proved to be exceptionally popular with my guests at previous parties. For decorations, I went with pink (to match my large stock of plastic pink flowers), turquoise (to go with my turquoise dining set), white and gold. 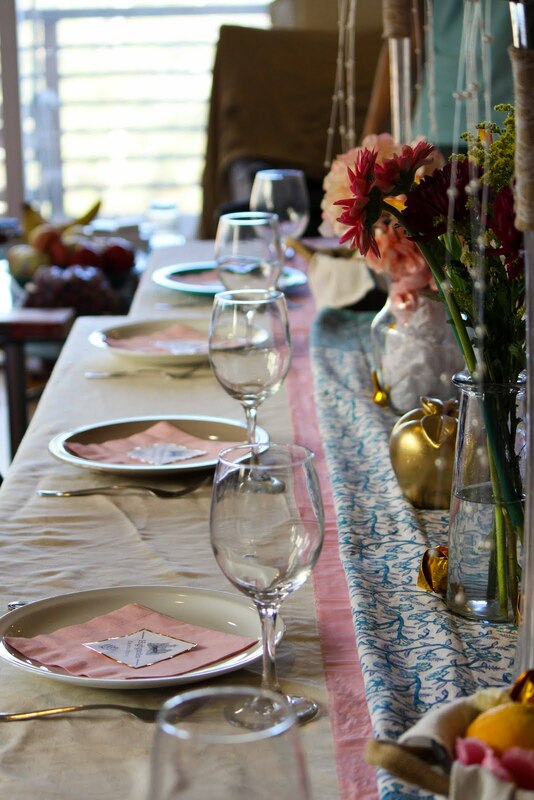 I used plastic & origami flowers and fruits as the main motifs on my dining table. In total, I spent ~$15 on the decorations (thank you, Dollar Store!). I was able to make use of many items I already owned, and just needed pink table cloths and napkins, and gold origami paper. Simple place settings: dollar store napkins and gold paper origami roses. 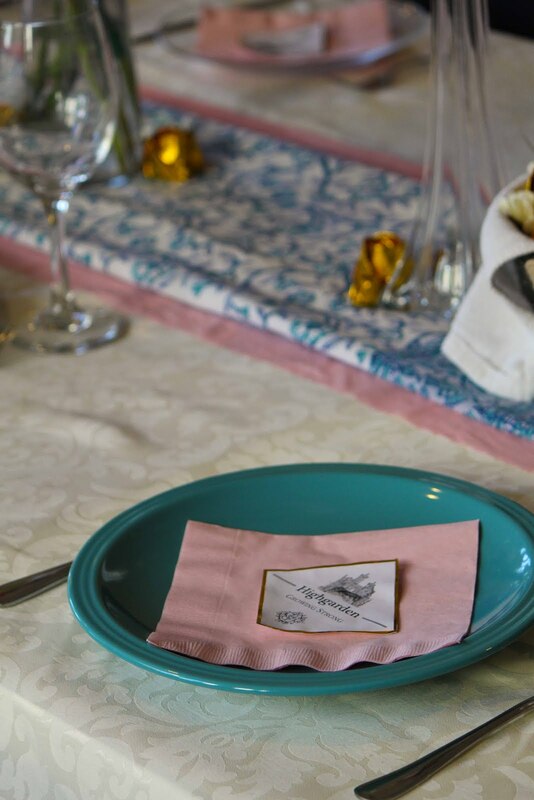 The place settings were pretty simple, napkins plus the menu: gold-bordered print-outs showing an artistic imagining of Highgarden with the Tyrell house words on one side, and the Clash of Kings passage on reverse. "Trenchers dripping full of venison stewed with beer and barley." I served everything in the order presented in the passage. 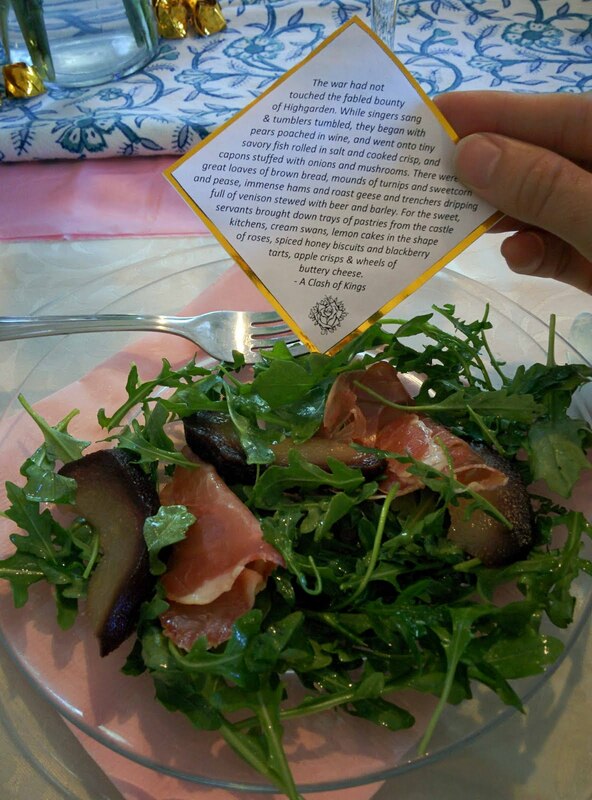 I took a little liberty with the poached pears, serving them with prosciutto on a bed of arugula (sorry, George RR Martin! You don’t use many green vegetables in your feasts!) – shown in the top right. Out of the hundred photos taken at this event, the “tiny savory fish rolled in salt and cooked crisp” and the turnips didn’t make it into any of them. "For the sweet, servants brought down trays of pastries from the kitchens: cream swans..."
I was particularly proud of my solution of “lemon cakes in the shape of roses.” I contemplated piping roses with icing onto cupcakes, or doing something like the apple rose pastries with candied lemons, but it all seemed a little fussy and unappealing to me. 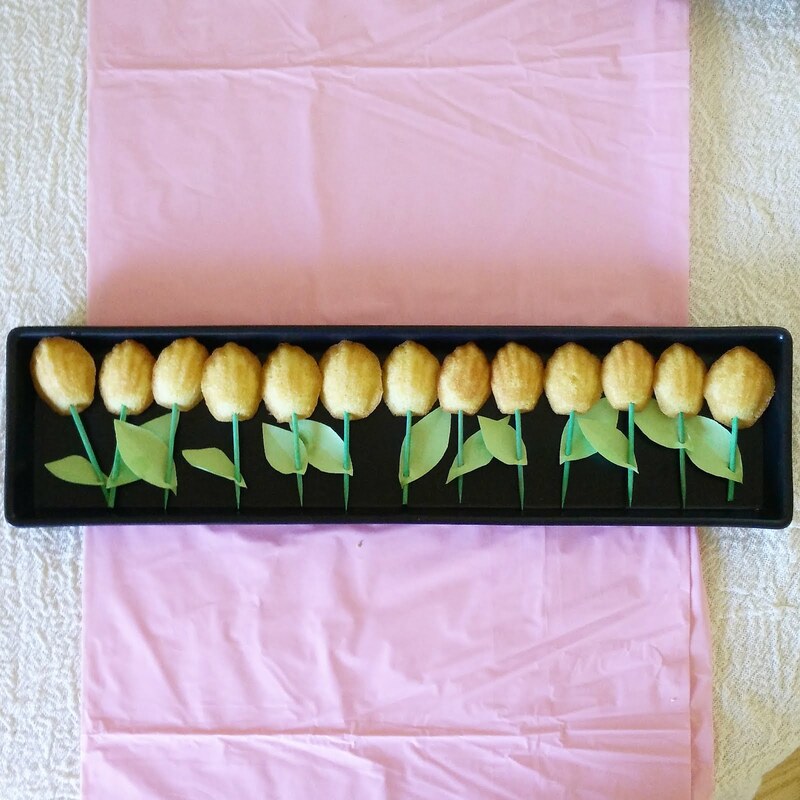 After a night of tossing and turning, I came up with using lemon mini-madeleines with stems & leaves! I used plain old green construction paper and kabob sticks dyed with food coloring and I think they turned out adorably! "Lemon cakes in the shape of roses." Want to throw your own Bitterbridge feast? 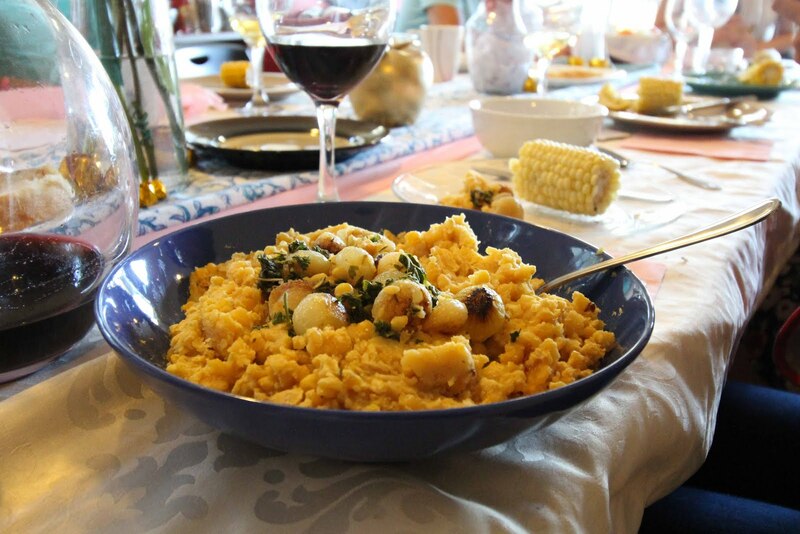 The poached pears, pease, turnip, hippocras and wassail recipes were all inspired from Inn At The Crossroads’ wonderful cookbook and blog. 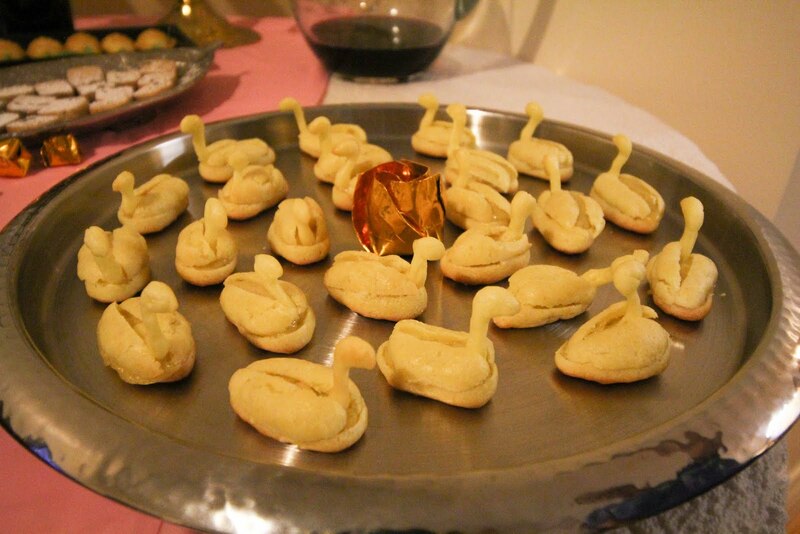 The pate-a-choux swans recipe: adapted from The Daring Kitchen and from my Pokemon Poffin recipe. The “spiced honey biscuits” I interpreted rather liberally, using this recipe for lavender-honey shortbread biscuits, dusting them with black sea salt. I felt edible flower cookies seemed more Highgarden-appropriate. If you make these, I highly recommend topping them with a coarse salt. It really elevated them beyond your typical shortbread cookie. 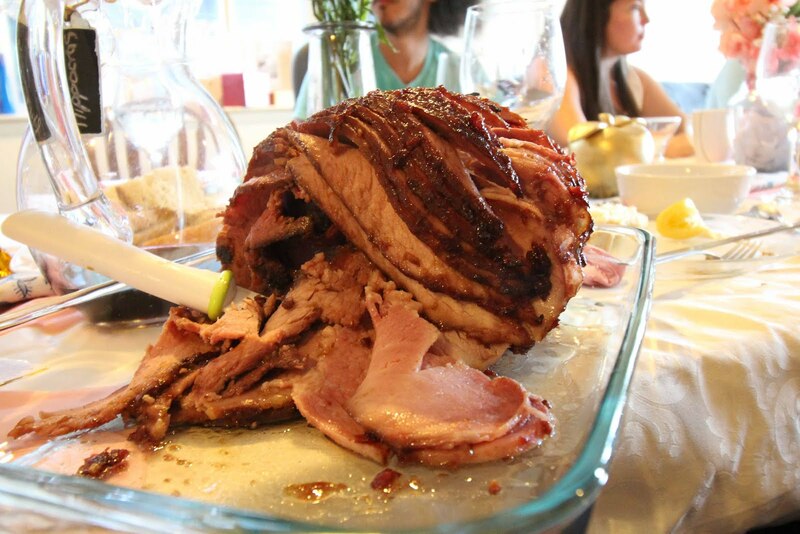 The stuffing recipe was of my own design but drew heavily from the amazing exegesis on stuffing from Serious Eats. Bread loaves were all No-Knead Bread 2.0 from America’s Test Kitchen. A very reliable and straightforward recipe. Iron Throne Centerpiece: crafting instructions here. Lemon cakes: check out my lemon-glazed madeleine recipe. 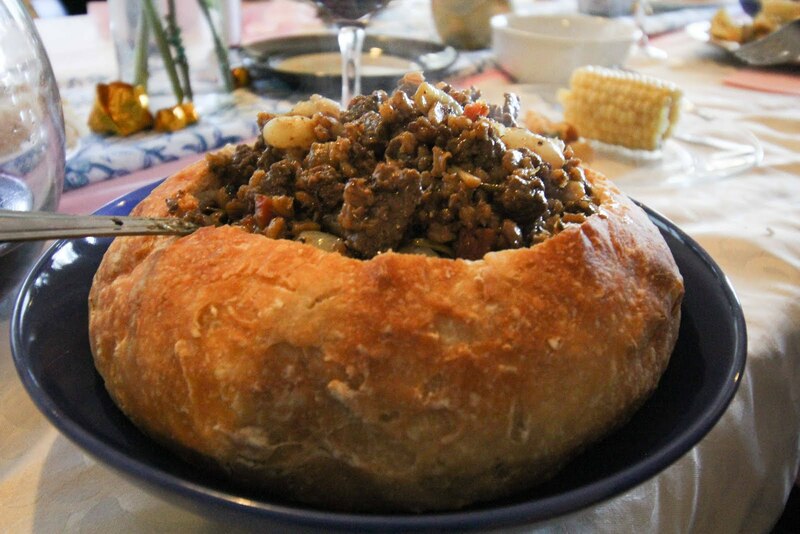 The “trenchers dripping full of venison stewed with beer and barley” (trenchers, bread bowls, potato, po-tah-to) was a recipe I made up as I went – check out the recipe here! Now to plan what to make for the Season 7 finale….? "Spiced honey biscuits [silver plate] and blackberry tarts [front]"